Yamaha MT 01 is an ultra cool naked bike with the Ohlins suspensions offering ultimate comfy ride. Check out the review to know the features, specifications, mileage and price. The latest hunk from Yamaha with the all naked look is MT 01 which has triggered sports riding revolution in India. 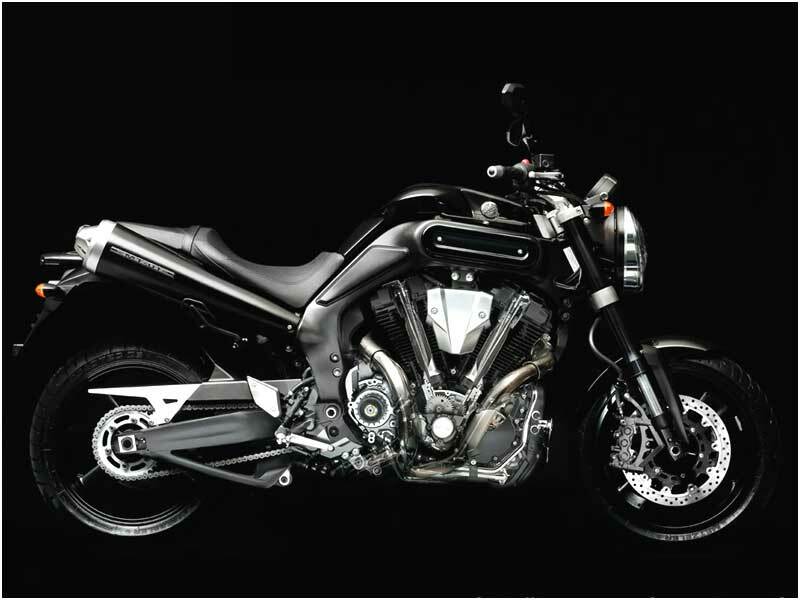 It consists of a hi-tech 1,670cc V-twin with an aluminium sports frame and cutting-edge suspension and brakes. It owns an enormous heart that produces huge torque for hammer-blow acceleration, a trendy sports chassis, a pulsating exhaust note that speaks aural ecstasy and monumental styling of the bike. The Engine is using Idle speed controller through which the Idle speed is controlled by an electronic stepping motor. It is a huge monster with top end seat and fantastic brakes. It handles easily and doesn't weave around at high speed even when the throttle pinned to the stop. With 1670cc engine, it produces a peak power of 90 PS @ 4,750 rpm whereas the R1 doles out 182 PS @ 12,500 rpm. The MT-01 is completely dominated by the engine both visually and structurally. The 1670cc V twin is simply astonishing to look at and to use. It's enormous but manages to keep most of the necessary external stuff as small and compact as possible. So the air filter doesn't get in the way, the injection is tucked up inside and things like the alternator and starter are all out of the way. Yamaha unleashed this powerful warrior with an aggressive set up look. Yamaha MT-01 has radial brakes and the exhausts looking like rocket launchers. The riding position is so comfy that the bum will stick glued to enjoy the heaven bound ride. The naked headlight works magnificently. It sports big clear mirrors, a horn that's as loud as the engine. The tank continues with conventional look and keeps a distinct family resemblance. The digital section houses a clock and trip meters. The fully adjustable upside down forks at the front is mated to an alloy frame with the big swingarms. The MT-01 has a particularly attractive metallic blue frame that goes very nicely with the silver bodywork. The wheels are the same moonstone-like blue and always look wonderful. One of the most significant new features to be seen on the New Yamaha MT-01 is the use of Ohlins front and rear suspension. New 43mm Ohlins front forks have been designed to offer high levels of feedback from the road surface. 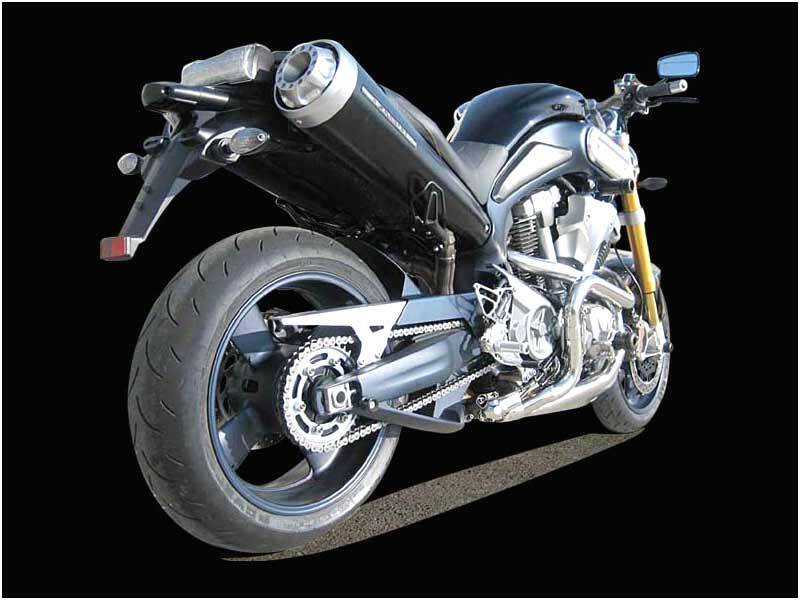 These high specification forks have been developed in association with Ohlins specifically for the new Yamaha MT-01. They feature optimal spring and damping settings which have been set to match the unique characteristics of the Yamaha MT-01's high-torque engine and aluminium chassis. The �hlins rear shock absorber features a separate reservoir which ensures consistent damping performance. This new rear suspension offers high levels of comfort combined with first class handling, stability and road holding. Creating a buzz for its looks and pick up, Yamaha MT 01 gives a mileage of 20-22 kmpl. The 2009 Yamaha MT-01 comes in Black color. 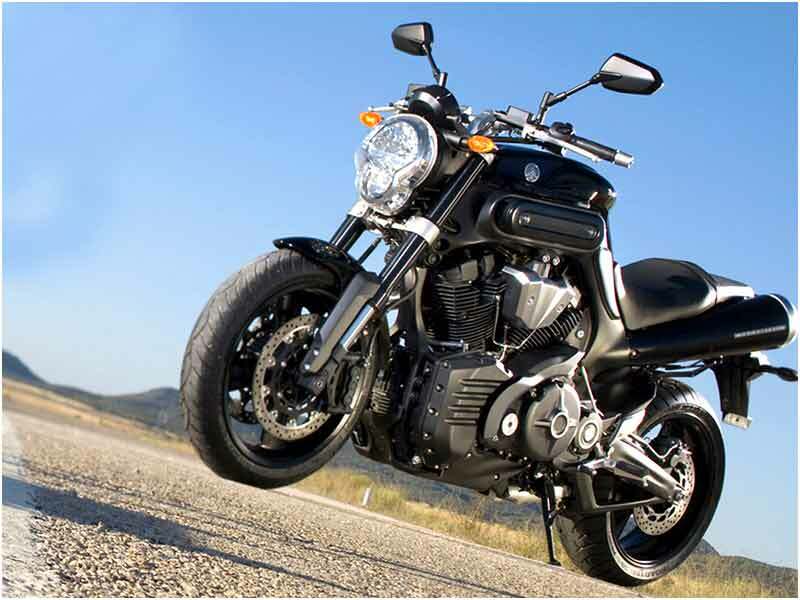 It has been launched with an ex-showroom price tag of 10.5 lakhs and the bike is available in New Delhi, Chennai, Bangalore and Ahmadabad initially.